Open from 10am-10pm with last entry of 9.30pm, you and your loved one can enjoy breathtaking views from the city’s highest vantage point during the day, sunset or after dark. 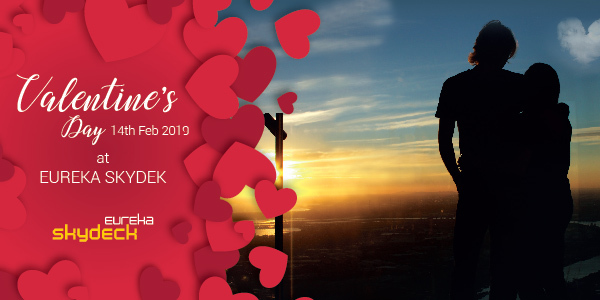 Love birds visiting Eureka Skydeck will be whisked up the elevator to relish in the breathtaking 360 degree, floor-to-ceiling views of the Royal Botanic Gardens, Albert Park Lake, the CBD, the Dandenong Ranges, and beyond. With spectacular views of the stunning Melbourne skyline, Skydeck is the perfect backdrop for an evening above the clouds with your loved one. Couples looking for an adventure can choose to appreciate Melbourne through the world’s only Edge experience. The awe-inspiring Edge is a three metres by three metres transparent glass cube, which slides out from the building, suspending those inside 285 metres above the city. The Edge at Eureka Skydeck will surely get the heart racing and has proven to be an extremely popular place for marriage proposals. Capture the experience with a photo on the Edge. All pictures are available for purchase and can be sent via MMS or email, ready for upload to Facebook, Twitter and Instagram. After the sun sets over Melbourne, Eureka Skydeck truly does become one of the most romantic spots in the city; a no-brainer for those looking to sweep their loved ones off their feet. Thinking of popping the question this Valentine’s Day and need a little help planning? THEN WE CAN HELP! Find out more here about our proposal package to make your proposal extra special! PLUS! Experience a truly unique Valentine’s Day with breathtaking sunrise views over Melbourne. This is a perfect opportunity for couples to enjoy romantic sunrise city views in a unique setting. Numbers are strictly limited and bookings are essential.